Snakes or Nagas have their distinct place and play a vital role in the Hindu and other religions of the world. Snakes are revered in temples and their natural habitat. Devotees offer milk and incense to snakes on Naag Panchami, a festival dedicated to snakes. Puranas have numerous stories where snakes play a central character which depicts a healthy relationship between nature, divine and human beings. The snake represents timelessness and dormant sexual energy or Kundalini in the coiled snake form in the Muladhara Chakra in the human body. Through specific practices, the Kundalini ascends until it reaches the highest chakra, the Sahasrara, which is considered the state of enlightenment and the highest bliss. Snakes are also considered the symbol of strength and renewal. The shedding of the skin of snakes is associated with life, death, and immortality. Lord Vishnu who also manifests himself in the form of the snake, is often depicted as sleeping on the coils of the Shesha Naag. Shiva, the Adi Yogi, has King Cobra as his sacred thread and two snakes Padma and Pingla as his earrings. Many other Gods also adorn themselves with snakes. As per Puranas, Sage Kashyapa had thirteen wives. Both his wives Kadru and Sursa gave birth to one thousand snakes each. Krodhavasha, his another wife also had fourteen thousand children known as nagas (snakes). Once Lord Brahma got angry, and few hairs from his beard fell on earth which took the form of the snakes. Similarly, there are various other stories regarding the origin of snakes on the planet. Vasuki, the king of Snakes, along with other snakes, danavs and daityas (demons) reside in the underworld. The Sheshnaag (snake with the thousand hoods) sleeps in the underworld. A female snake is called Nagi or Nagin. Worshipping Goddesses in the form of a snake is common across many cultures and religions. Walutahanga, a Melanesian Goddess was hidden by her mother as she was born with eight heads. Her father cut the girl into eight pieces and threw her bones into the ocean when he saw her. The legend says that she torments human beings with the enormous waves as revenge for her murder. She rewards her devotees with coconut and clear water streams. In ancient Italy, Vanths was considered the serpent Goddess of the underworld who accompanies people to their graves showing them their path with the help of snakes. Qadesh is an Egyptian Goddess who is depicted as naked wearing cow horns, standing on a lion and holding Lotus (representing female genitalia) in one hand and snakes in her other hand. Snakes represent male genitalia. Nisaba is one of the most learned serpent Goddess from Sumeria who represents literacy, astrology, temple art, and architecture. Ninhursag is another Sumerian serpent Goddess of birth and rebirth. She lives with her consort, the god of Wisdom. Fed up with the repeated incestuous behavior of her husband with their daughter and granddaughter, she curses him with death and disease. Later, she forgives him. Kunapipi is a mother goddess from Australian aboriginal mythology who was eternally pregnant and gave birth to human beings, animals, and plants. She could transform herself into a snake and devour men. Kadi was a Babylonian Goddess of justice who had the body of a snake. Nu Ka is a Chinese creator Goddess who made the first human beings. She has the body of a serpent and face of the human being. She made human beings with yellow clay, but soon find the work too dull and challenging. The finished ones became noblemen and the rest became poor peasants. Coatlicue is a serpent goddess from Mexico who mothered sun, stars and the moon who wears a skirt of snakes and a necklace made of human hearts, hands, and skulls. Within her, both womb and grave exist as she devours everyone. She remains pregnant and still is a virgin. Pidari is a Tantrik Goddess who is regarded as a consort of Shiva or manifestation of Kali. She is offered blood and alcohol in Aghori rituals. She has flaming hair; three eyes holds a noose and drums to scare away the evil. Janguli is a Buddhist and Tantrik Goddess who has the hood of seven white snakes who could remove venom. 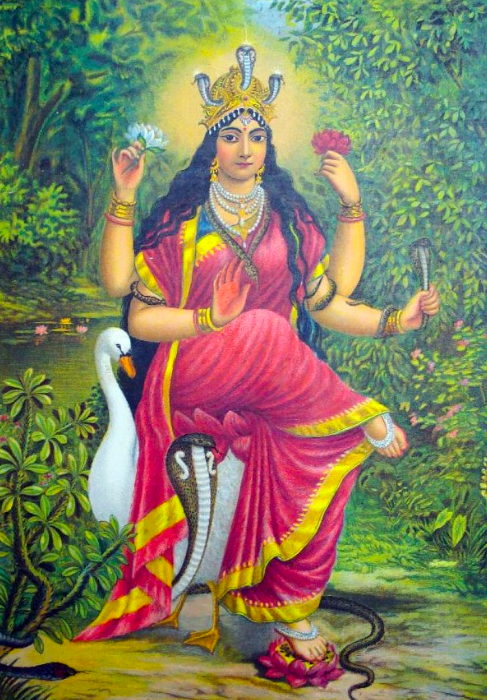 Goddess Manasa is an Indian Goddess who is associated with snakes. She is the daughter of Sage Kashyap and Kadru. Vasuki is her brother. She is worshipped for snake bites and fertility and childbirth. She is also considered a form of Shakti. As snakes represent the umbilical cord that ties all of us to the land and nature, the serpent Goddesses symbolize both the conception of the universe and the fragility of existence. They represent both calmnesses -good and chaos – evil in life. Snakes! ah my fav beings 😀 … as usual good article! Many new things learnt! Just to add/correct: There is a difference between “sarpa” and “Naag”. Both are not the same snakes. In Gita 10th chapter: 28 and 29 shlokas, Krishna says: “Among the Sarpās, I am Vāsuki” and “Among the Nāgās, I am Ananta”. This is very crucial point. 1) Sarpa/serpent is the snake that creeps and crawls. This is the flow of time. This expresses as the life of a being and brings out his “Vāsanās” or root attributes (in time) and hence called “VĀSUKI”. This is the snake linage born to Kadru. 2) Nāga: This is the constant time that is background to the previous. That which we perceive as past-present and future, is ONE timeline in absolute sense and hence is called ANANTHA (Infinite/having no boundary). This is the snake that exists as the bed of Vishnu or ornament of Shiva or Goddess. It is never “Born” in any story — It exists as is! 🙂 … I guess this adds to the Indian mythological part of your article. But the rest –I take your word for it 😀 … Must have been hard to bring out the focused world-mythology together! As usual, your inputs always add an interesting dimension. BTW I didn’t knew this difference. I liked the analogy of time and infinity. So, One doubt. What is the source (which puran or folk lore, if you remember) for telling Kashyapa having thirteen wives? As much as I remember his wives are only TWO, in Vedas and also Bhagavata Purana & Vishnu Purana. Just curious! What symbolism could 13 have at all, as far as Kashyapa is concerned. Kashyap had thirteen wives : Aditi, Diti, Danu, Arishta, Sursa, Surabhi, Vinta, Tamra, Krodhvasha, Ira, Kadru, Khasa and Muni. Actually, Puranas have multiple stories about everything. True, many stories and “apparent” confusions are trademark of puranās 😀 …. Sages spent few seconds encoding and I am spending all my life decoding .. hahah .. This is from Brahma Purana. Of course, as He is PRAJĀPATI so the creation should come from HIM (and his wife’s 13 aspects). I am still wondring why 13 and not 12. I am damn sure, one of teh wives is like substratum of all. Because, Prajapatis are 12 in number and they rule 12 months of a year. Yeah, there is a rationale behind every word that is written in our scriptures. We may or may not understand it today. Your comments are very enriching. There is much to gain, so please keep reading and keep writing. There is no point in writing just for likes. I mean if I have to write for ‘ likes’ and upvotes, I will write on different kind of stuff and I can do that on facebook. I am writing as this platform provides an opportunity to interact with like -minded people, so that I can learn and understand from their perspective. Me neither, until few days back — when I finally read Gita for the first time. I must say, reading Gita is like a buffet of all the scriptures’ wisdom – Depending on the capacity of the reader, it unveils so many secrets. I used to think this was too much exaggeration. But, when I read — I realized its grandeur! Every minor detail is a banyan tree — (like, why should he mention nagas and sarpas separately?, which lead me dig deeper). I tried reading Gita, twice or thrice but got lost. I have to start reading it again. Thanks for reminding me. If you don’t mind, can you tell me whose interpretation are you reading? I tried reading one from Iskcon temple. I would be very glad to suggest such things 😀 … Well, ISKCON and all I am not a big fan. Never liked the works either – personally. 2) And if you have time and energy, I would suggest Paramahamsa Yoganandaś “God Talks to Arjuna” — its two volumes, but it gives a YOGIC perspective. Thanks for your detailed response. Will go through all this one by one. “Essays on the Gita – Sri Aurobindo”. Its technical and intuitive. But for me personally, his language is too hard! But its worth a try! Even I find Sri Aurobindo too intellectual.